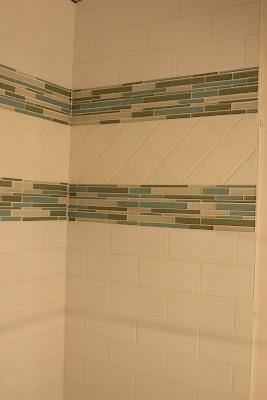 How to tile a shower in 48 seconds! Ah wouldn't that be nice but in reality it took a bit longer. 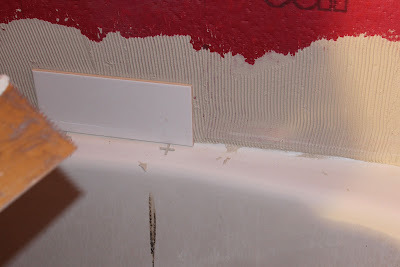 This will give you a great overview of the process though from sealing the cement board to wiping the tile clean. Now for a bit of the explanations behind the process. Here you can see the cement board and the coating is a waterproof membrane that is rolled on. It's a bit of extra security and peace of mind. This pre-made shower niche was added by cutting into the cement board exactly where it would go and once that was done the edges were sealed with caulk to ensure against future leaks. I had already planned out the tile layout so the next part was to actually start setting the tile. As I worked my way up we then came to the layer of glass tile, which actually came in a sheet and which we cut in half for the bottom and top layers. Then the addition pattern was set and the second layer of glass tile will be added above. 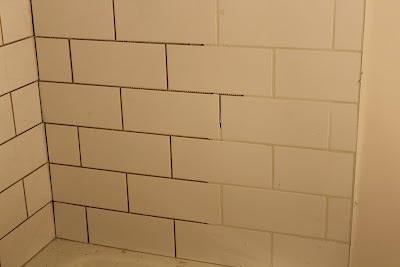 Then the additional layers of tile are added, let to sit overnight and the grout is applied. 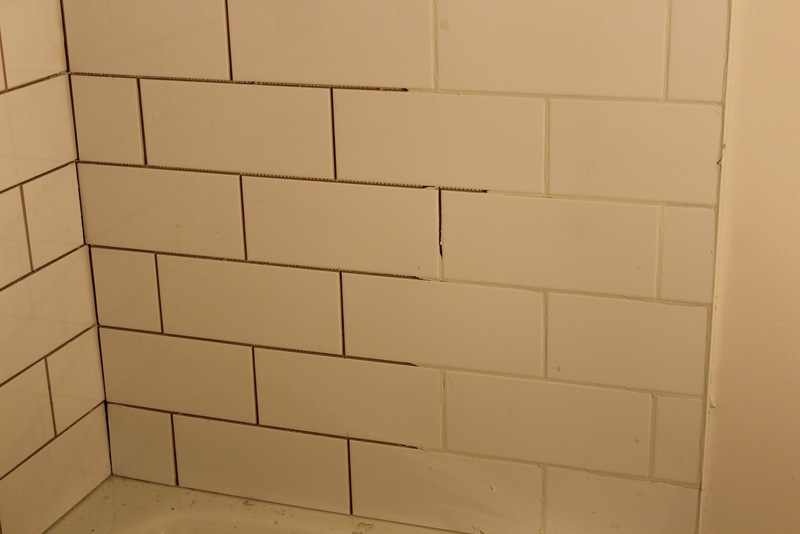 The grout is applied and then smoothed over as an initial cleanup with a damp sponge and allowed to sit again overnight. The final clean up with again a damp sponge. 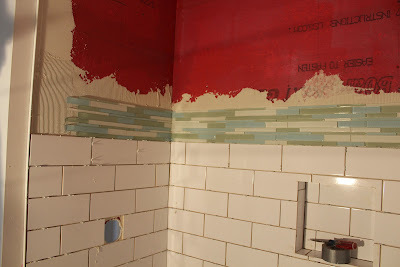 That's the basics of tiling a shower and I do have to apologize for the yellow color in the photos. This was done as the project took place and not under showroom settings without professional lighting and such. Hopefully it will give you a good idea of what goes into tiling a bathroom shower and wouldn't it be nice if it could be really done in 48 seconds! Avente's Spanish Tiles are beautifully hand-painted in a variety of colors and patterns on ceramic bisque using time-honored techniques. Using the Majolica technique of glazing, our Hand-Painted Spanish Ceramic Tile designs include colorful patterns from the different regions of Spain, or the traditional blue and white found in the New Iberica border tiles and liners. The Majolica technique utilizes an opaque white tin-based glaze that is ideal for vibrant, colorful patterns and designs for ceramics. The centuries-old technique is believed to have originated in 9th century Mesopotamia with the desire to imitate the white porcelain wares coming from China. Over time, and with the spread of Islam, the art made its way through to Northern Africa, and to what is now known as Spain, Italy, The Netherlands and the United Kingdom. Our hand-painted Spanish ceramic tile designs include borders, corners, large decorative tiles, and accent dots. 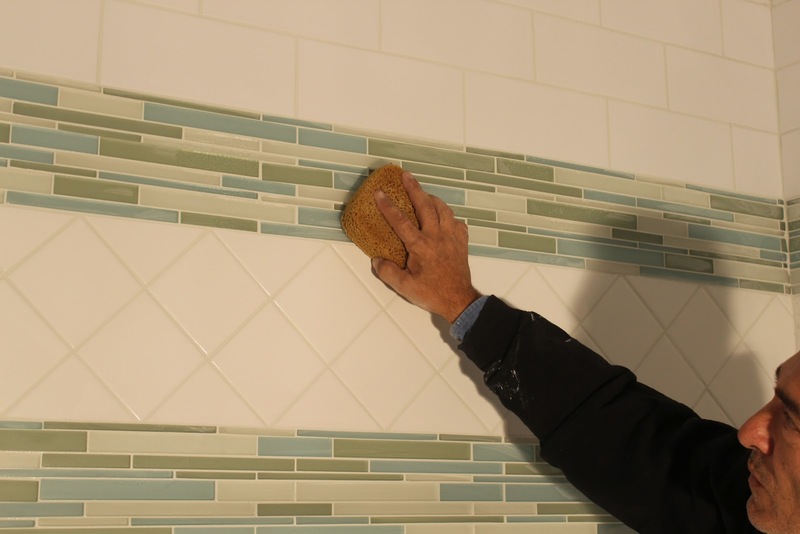 Use the 3"x6" tiles to create a border, or make a bold design statement using the 2" dots in a row. The 1" dots, used as an accent to a floor inset, are a fitting complement to a backsplash consisting of 6"x6" tiles of the same design. These versatile collections, with their stunning colors, create a timeless look that blend well with hand-painted Spanish Field Ceramic Tile, which were created specifically to complement the subtle color schemes found in our Hand-Painted Spanish Ceramic Tile line. 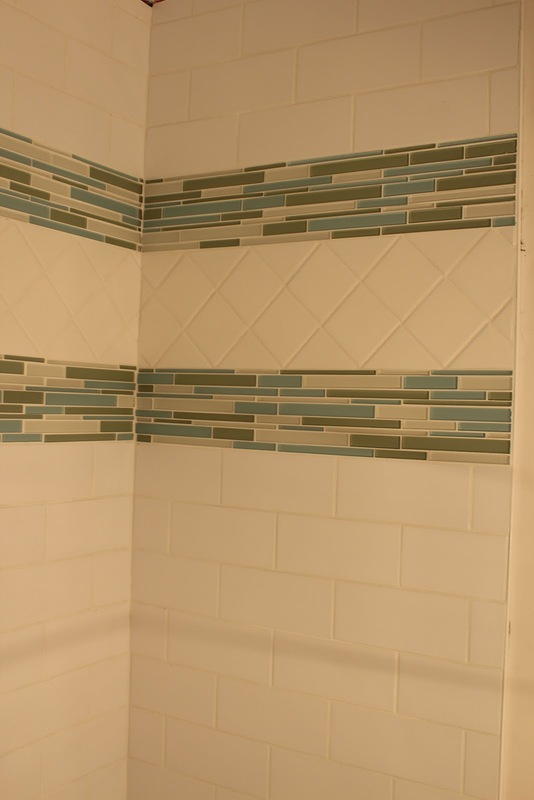 Use these tiles for kitchens, bathrooms, warm weather pools and fountains. For more inspiration, check out Spanish Style Stair Risers, Spanish Tiles on an Entry Path, and Spanish Tile on Stair Risers. 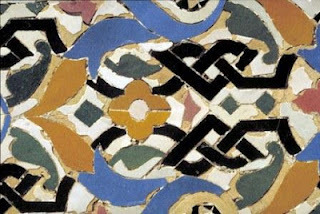 Considering Spanish ceramic tile for your next project? Then let us help you find some inspiration. Visit our Ceramic Tile Design Ideas section. Where would you use hand-painted Spanish ceramic tiles? What pattern would you choose? 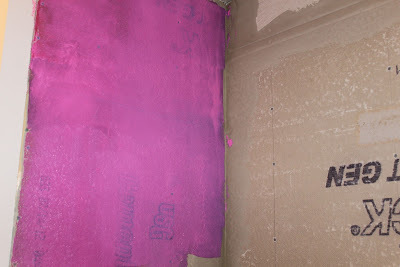 Earlier this year I did a guest post for the Gold Notes blog called, Tile Trends from Coverings 2012. 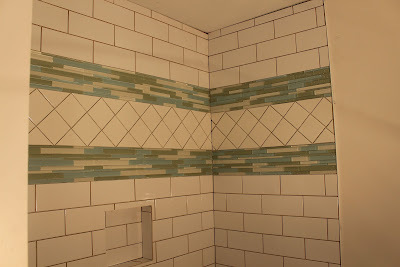 I reported that I was seeing a trend to use texture, color, and geometric patterns in tile. I'm excited about this trend because I like to see color and pattern embraced in design. Today I'll show a few examples of how that prediction is growing - based on the samples and installations we've been working on. Cement tiles have been extremely popular this this year and I want to show you how color and pattern are being used. Look at some of the samples we recently shipped. The Melilla Cement Tile use nine colors in this bold warm palette with a playful Latin feel. Our Montecristi pattern uses five colors here including: White, Antique Ivory, Gray, Indian Red, Peach Puff. I love the bright Indigo inset with the warm Tibetan Gold in Geo 8 – the simple pattern reminiscent of ceramic tiles and is great for breakfast nook or patio. 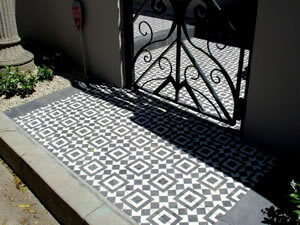 Cement tiles in strong patterns in a black and white or black/white/gray colorway are also popular. Neiba Cement Tile illustrates how a clean pattern in "basic black and white" creates a floor with a focal point in an easy-to-use and flexible palette. Try using an accent color like red to really make the design pop! Simple geometric patterns in basic colors are being used in both residential and commercial installations. The Geo 10 in our standard colorway of Cana Green and Suede remains very popular. The patterns generally work well in homes with contemporary architecture styles especially when utilizing a simple two or three-color palette. However, we have seen Geo 10 used in a residential application with the classic black and white in one bath and the Indian Red and white used in a different bathroom for the same home. 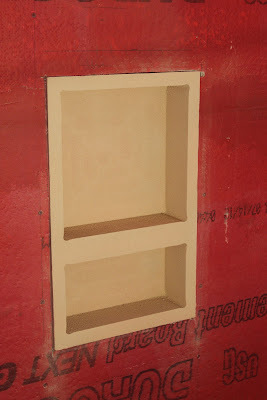 Geo 9 in Indian Red and White will be used in the entry for a new bar opening in Chicago this fall. 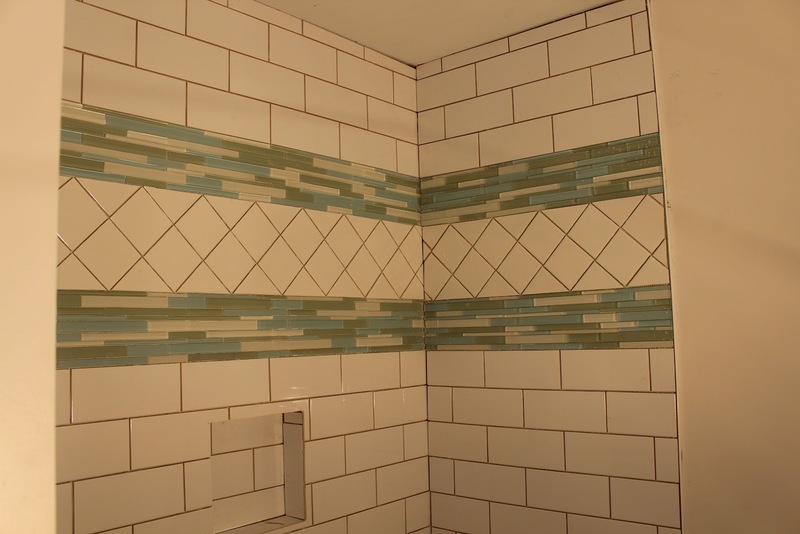 There are certainly a variety of styles and designs in the cement tile samples and installations we’ve seen recently. 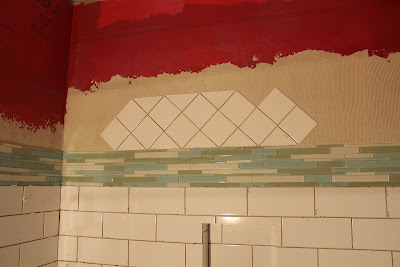 But, I think you get the sense that people are not afraid to try tiles with bright colors. And, there is definitely a design trend to use the classic geometric patterns in simple, easy-to-use colors like white, black, and red. Curious? Take a look at our Geometric cement tile patterns and see if there is something that catches your eye. What do you think of geometric patterns and bright colors in cement tile? 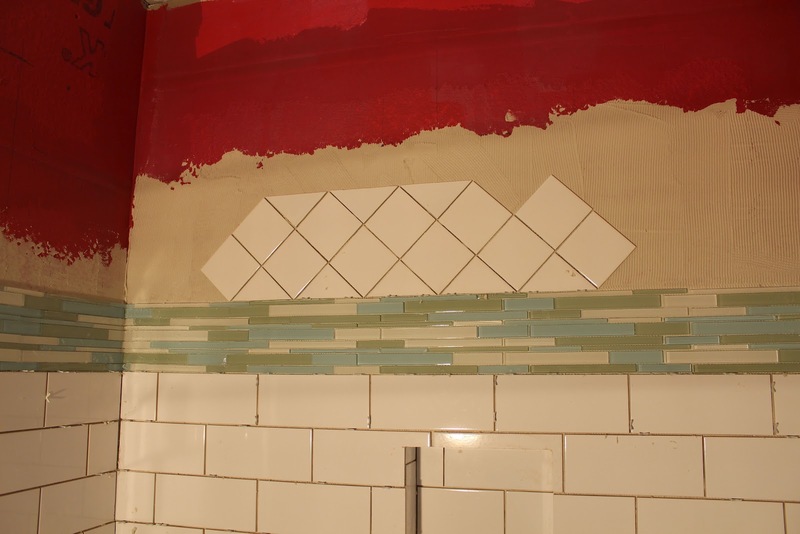 How would you use brightly colored pattern tiles or geometric patterns in your kitchen, bath, or dinning room? Countries with colorful histories have always provided a deep-rooted fascination to outsiders because of their culture, traditions, food, and most importantly, the art produced within the country. It’s through this art that we, the current generation, are allowed to take a brief glimpse through the artist’s mind and eyes of what was seen, felt, and experienced at the time. Image Source: Ceramics Today via Saudi Aramco World. Photo Credits: Peter Sanders/Saudi Aramco World/PADIA. But what if an art or art form remains unchanged through the centuries? Moroccan art and architecture has been steadily experiencing a renewed interest thanks to talented, visionary designer and architects. 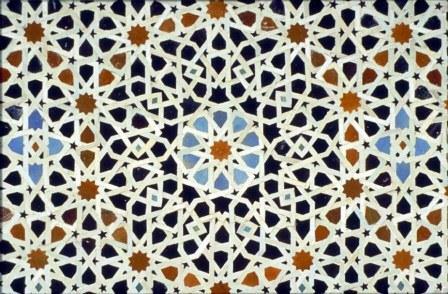 But for this post, I would like to focus on just one of these art forms -- the mesmerizing forms, colors and shapes of Moroccan tile, Zillij (also spelled as Zellige or Zellij). The 17th-century Nejjarine Fountain, retiled and repaired by two generations of master zlayjis of the Benslimane family. When the Moors conquered Spain in 711 A.D., they introduced various forms of art and artistic techniques, including a unique custom of painted ceramics, called Zillij. As defined by Islamic law, which prohibits the depiction or likeness of living things, Zillij uses only geometric shapes, straight lines and vibrant colors. 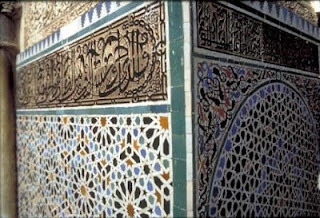 These handmade creations can be seen adorning every palace, museum, home, street, mosque, fountain, wall, walkway, and so on. It’s not only an art form; it’s an essential building material. 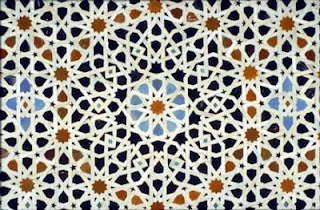 Zillij patterns, including a taqshir calligraphic border, at the Attarine madrasa (Islamic school), built in 1325. Throughout its handmade history, Moroccan Zillij has been created by master craftsmen called “Maalam Ferach.” From an early age, pupils would study their craft under the tutelage of a master. Often times, techniques were handed down from one generation to the next within the male members of the family. 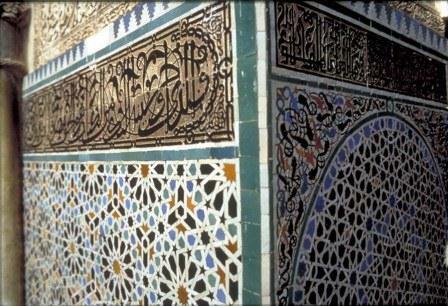 Zillij, or tilework of Morocco.Image Source: Ceramics Today via Saudi Aramco World. Photo Credits: Peter Sanders/Saudi Aramco World/PADIA. Handmade cement tile inspired by Moroccan patterns. "Fez" by Avente Tile. With such attention to detail fostered by years of discipline and learning, it’s no wonder the long-lasting beauty and versatility of Zillij has remained popular amongst those who truly admire craftsmanship with the added touch of the exotic. A wonderful blog to follow for all things Moroccan is My Marrakesh. It’s written by author, designer and photographer, Maryam Montague. How would you use Moroccan tile? 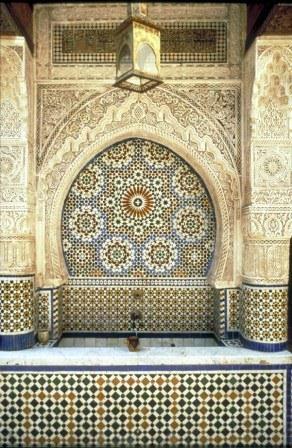 Where have you traveled and seen Moroccan influences in tile and architecture?